Voice tone is very important to your dog. Don’t believe it? Have you ever said your dog’s name over and over when she is only a few feet away and she still doesn’t look at you? This happens all the time. When your dog ignores you (assuming she isn’t deaf), it is because she has determined that you’re wanting her to do something she’s not willing to do at that moment. Plus, your tone of voice tells her that she’s got a little wiggle room—you don’t REALLY mean it. Have you noticed when you reach a level of frustration, your dog will finally stop and pay attention, or turn toward you? This tone of voice indicates that you are serious, and usually the next action from you is to do something physical, such as grab her. 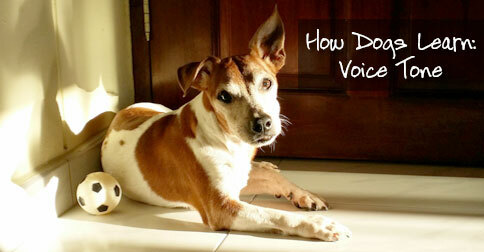 Even subtle differences in your voice tone can create a reaction from your dog. One thing I focus on when beginning a training consultation is the specific behaviors a potential client wants to work on with their dog. One common answer is that they want their dog to listen and come when called. I call this ‘Focus’. Any time your dog pays attention to whatever it is you want and reacts immediately to you, your dog is focused. It takes a year of more of consistent communication to get true focus. Voice tone is a very important aspect of whether or not you are serious, and as I said above, your dog will pick up on even the most subtle changes in your voice. If an owner tells me their dog knows the sit command, I will ask them to demonstrate. Usually they end up asking the dog to sit three or four times before the dog actually sits and I observe the changes in their voice and body language to get the dog to do the sit. This is where I explain to them that if their dog did not do the command on the first “sit,” then they are not doing it willingly. Also, I will demonstrate (very over exaggeratedly) what they looked like when giving the command. Overusing a command is a lot like overusing motivation as a method of training: It becomes less effective over time. This becomes a very important aspect in training and communication. In this segment of understanding how to communicate, I am going to give a detailed account of how dogs learn from us. This is important, because if we know what a dog’s learning process is, then we can better understand why they are doing (or not doing) what we expect of them. Note, when I am training people to learn to communicate, I explain both how humans teach and how dogs learn. We only teach through praise and only when a dog is making a choice. The number one way a dog learns from us is from our body language. And remember that the only way we teach a dog is through praise. If you look at each of these things separately, they begin to make very good sense. When your dog is making a choice and you praise her for making that choice, you are teaching her. 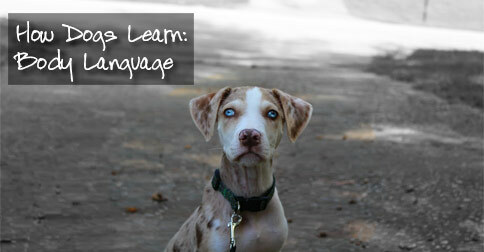 Your body language has a lot to do with your dog’s learning, because it conveys either positive or negative attention. How your dog perceives your body language will determine whether she thinks it is praise or correction. If she continues to do what she is doing, then her perception was praise, even though you thought you were correcting. Remember, a correction is only a correction when your dog stops doing what she is doing and pays attention to you. It usually takes about six months for the owner too see the true behavior and true personality of their new dog. What I figured out is that it takes about this amount of time for a dog to figure out the owner’s body language. When you are happy, sad, serious, or not-so-serious, you give off certain signals, or language, with your body that represents those emotions. Dogs figure this out rather quickly. Have you ever noticed how, when you’ve had a long, tough day and you feel beat, that your dog can sometimes sense this and will just lie at your feet instead of pestering you like normal? This is because she has learned that your body language says you don’t want to play. Now, if you arrive home full of life and energy, it seems your dog just can’t get enough of you and won’t calm down. Dogs key-in on the slightest things from us: everything from a raised eyebrow to a raised hand. When a dog does not understand something you are doing, there are many ways for them to show this misunderstanding. They may duck or cower, bark at you, even try to get between you and another person. These are all signs of a lack of communication and evidence that your dog is trying to figure out what is going on. I have learned much of this from my dog, Oz. Whenever I come home in a foul mood, he will cower and walk around looking like he did something wrong. At first this bothered me,and I would look at him and tell him he was okay—it was just me in the bad mood. It took me a while to realize that I was reinforcing this behavior by giving him attention when he acted that way. Soon, I began to understand that when Oz was ducking and unsure, it was because he was trying to learn from me. He was watching me. If I gave him attention, he would continue to behave in that way when I came home, no matter what my mood. When I stopped giving that behavior attention, it soon went away and he greets me happily at the door every time. Another important part of body language is a dog’s stress signs. Noticing these stress signs can really help when communicating with your dog. The reason I mention this is because sometimes we can confuse stress with the above signs of miscommunication. Although the signs may be similar, they are very different depending on the situations you are in at the moment. Also, rewarding (or giving attention to) stress is a very common practice as well. As you dive even further into this training course you will read, hear, and see many examples of what I am writing about here. Another thing I have learned is that dog is not man’s best friend; dog is dog’s best friend. The reason I know this is because dogs pick up on other dogs’ body language very quickly. Dogs have a few ways of showing their intentions very quickly to another dog. If the dog’s body language is not consistent, then usually the other dog may get aggressive or just ignore the new dog altogether. Dogs understand each other very well. This does not mean that a dog cannot send another dog the wrong signal, it just means that dogs key-in on other dogs much more readily than with humans. Body language would be considered the first language in the dog world. They don’t use words, phrases, or sentences as we do, yet you it’s obvious that they communicate quite clearly with each other. There are many different signs a dog gives in many situations; fear, stress, protection, play, affection, and love. Without going into all of the signs for every situation, I can just tell you that each sign is very different in any given situation. Once we learn what these signs are, we can really improve on how we are communicating with our body language as well. I go into many stressful situations with owners and dogs and the stress is diffused quickly because the dog does not view me as a threat. Owners are sometimes even shocked at how differently their dog will act when I come into their home than when a friend or neighbor visits. This goes both ways. Sometimes I do pose a threat to a dog, because that dog has been the dominant of the household, and when I come in I have a very dominating presence to a dog. Read this article about how dogs learn through the hierarchy, to understand why a dog would be threatened by me. There are many great books and videos out that show these signs and give great examples. I have learned more by watching this first-hand in dog parks, at people’s homes, and in many social situations. The more you understand and practice good body language, the better you will be at communicating to your dog. How does the hierarchy work and why is it so important to dogs? Now remember, these are my observations, not research on the subject. 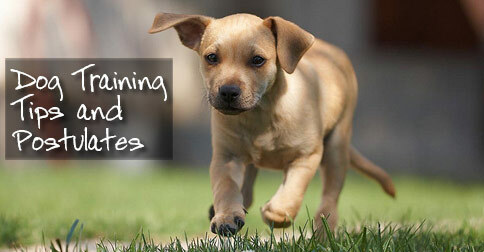 I have learned this throughout training dogs and people, and my conclusions have been reinforced over and over. This is also over the years of training dogs at all levels of intelligence. Training with different levels of intelligence has really reinforced what I have learned because I see, especially in multi-dog families, that it is very important to a dog to understand where she belongs to be happy. Otherwise, the dog is testing the boundary all the time and this causes for a stressful relationship with an owner. This is also why I get the calls and the clients I do. If it was not for this misunderstanding, I would not have a job! So, with that, I will explain it the best I know how. This is one of the most complicated things to try to explain and yet I understand it very well. The reason is because dogs are not created equal, and because they can’t talk. 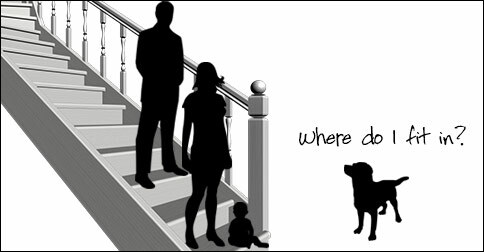 With this reasoning, a family of four with a dog there is a #1, 2, 3, 4, & 5 sequence in the home to the dog. There is not a 1, 1, 2, 2 & 3 as we might believe. Humans tend to think that all people are equal until proven or represented otherwise. In a dog’s mind, you are either above her or below her—never equal to her. Once I understood this, I realized how people are so inconsistent that it can be very confusing for a dog. Not in the sense that you have to do the exact same thing the exact same way every day. In the way you keep the same rules and have some sort of consistency in your life. If you don’t, then your dog will test that boundary every time. Being spoiled and running the house, or family, is two different things in my mind. The spoiled, or cute, dog might warrant a call to a trainer, but for the most part I just hear about the results of not training. Everything from giving the dog away to the owner just giving up and letting the dog continue to do the behavior. I did that with my Yorkshire Terrier. We never got him potty trained, and for thirteen years he pooped and peed in our house. If I knew then what I know now, his life would have been so different. Because of this inequality, we have to be aware of the things we do that make the dog feel like she is higher in the hierarchy and we have to take the dominant role. Do we have to take the dominant role all the time? No. Once we have established dominance, we should take on a submissive every now and then throughout our lives with our dogs. Once a dog has established its place in the hierarchy, you will see her take both dominant and submissive roles with other dogs, and with her human pack as well. For example, I will hear people say that they heard or understood that you should never let a dog go in or out of a door first. When establishing the hierarchy this may be important, but in the long-run it isn’t. In my home, the hierarchy is understood, and every now and then my dogs go out the door in front of me. I can do this because there is no question as to who the dominant is in my home. One question I ask a new client with multiple dogs is, “Who is the dominant?” Ninety percent of the time the owner will tell me which dog they think is the dominant. My response is, “Then you have a problem here, you should always be the dominant.” Most times they understand. Sometimes they don’t, and I realize quickly why they are having issues. If you are not willing to establish that you are the dominant in your hierarchy, just remember, your dog will always test the boundaries. This is not a bad or good thing; it is just a fact and something I have observed and learned over the years. So how and why does the hierarchy work? The way I understand it is like this: If you create an environment of structure, control, and dominance; you are creating rules, confidence, and trust. These are the basic necessities to being at the top of the hierarchy. If any of these falter in a way they can be questioned by your dog, then she will view you as lower in the hierarchy. Or, your dog will continue to test for a higher rank. POSTULATE: Structure is rules. By creating and abiding by these rules you will be doing the same things and always expecting the same results. Control is having knowledge, understanding and confidence. Dominance is creating trust. If you establish consistent rules, abide by those rules consistently and confidently, then you are creating it so that your dog will trust you in any situation. Once this trust has been established, then you will be viewed by your dog as the dominant. What dominance is not about is being the biggest, the meanest, or the strongest. During training, this weak area is what I concentrate on. An owner may have tons of structure, yet have little to no control. If this is the case, their dog will continue to test the boundary and test for a higher level in the hierarchy. There are many ways to help you see where your weaknesses in the hierarchy. Below, I will describe a scenario, state a few observations you may have understood or may not have noticed, and give an explanation to help you to recognize in which area you may be lacking. 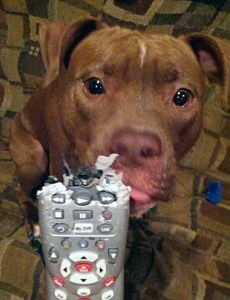 You arrive home to discover that your dog has destroyed the remote control to your TV. When you notice the remote, you get very upset and turn to find your dog cringing on the floor near you. You are not sure when she did it so, you scold her severely, showing her the remote control while you do so. You then put angrily her in her crate. Several hours later you have to let her out to feed her and to go to the bathroom, and you are still angry because you have not been able to watch your favorite shows. In a huff, you feed her and take her for a walk, not really paying attention to what she is doing or even aware if she has done her business. Later that night, as you are preparing for bed, you notice a spot on your pillow. As you observe closer, you see and smell that she has peed on your pillow on your bed! Again, now even more enraged, you scream at her (maybe even spank her) and rub her nose into the pillow. Then you angrily put her into her crate. All the time you are wondering why she did this. Why would she pee on your bed when she has never done anything like this before now? As a far as you knew, she was totally potty trained and never even peed in the house. There are many things going on that you are communicating to your dog in this scenario that you may not realize. I will go through them in order. First, upon finding the destroyed remote, your energy and body language began giving off a signal that your dog recognizes as very negative. She has learned that when you behave this way, something bad is going to happen and usually to her. She cringes, having no idea why you are upset because the remote served no purpose to her other than passing the time hours ago. It was also attractive to her because it was strong with your scent and it was plastic, one of the materials that are in many of the toys you give her. When you are scolding her and showing her the remote, you are sending a mixed signal. If you grab her to put her into her crate, you are sending an even more confusing message by touching her, because to her, a touch is a reward. Yes, the yelling is negative and can be a correction for a behavior, but that behavior has to be caught within just a few seconds (or even better, at the time) of the incident to be effective. Remember, a true correction is when you make your dog stop doing what she is doing and pay attention to you. You cannot do this if you did not catch her. If you did not catch her, ultimately it is your fault for giving her too much freedom too early. Next, you take her out of the crate. When you take her out, you are still angry and hanging on to the energy and the body language which, again, she has learned means trouble. Now you have made coming out of the crate a negative thing as well as you coming home. She has no idea how to act around you and is not sure of what you want, even when you take her outside to potty. You are not communicating the norm—to use the bathroom—you are confusing her. Here is a major inconsistency that is communicated to most dogs. They do not know why you are angry because you have not been clear and you did not catch her in the act. You just reacted to something that happened possibly hours ago. This inconsistency creates distrust in your dog and she now has to decide whether or not she needs to be higher in the hierarchy to create structure and consistency. Then, because you are still angry, you leave her (again) on her own. During this time on her own, she feels the need to communicate to you that she is willing to take a higher role in your hierarchy. One way for her to do this is to mark her sleeping area and to mark the areas of the others in the pack to show her dominance. There are many other ways, this is just one example. Next, by again taking your dog to the scene of the unwanted behavior, you are sending a very mixed message. You are not correcting for a behavior she just did, you are giving attention to what she did and you are touching her. You are also still mad and she does not understand why. As far as she is concerned, you should be happy she is willing to take on a dominant role since you are not. This had nothing to do with the her potty training—this was all about dominance. What she did or did not do outside is irrelevant. Her reaction to your behavior is a very common and misread action done by dogs. Your dog has to know her place in your pack. If you do not create rules (structure) and you are not consistent with those rules, she will think she needs to take the dominating role in your home. All of the actions from you (in this scenario) are not inappropriate actions (although I do not condone spanking, I know it still goes on); they are just timed very badly. If you were to react in the same way, catching your dog in the act, she would have stopped and cringed. That would have been the best timing. When she is cringing, she is trying to figure out what just happened. At the point a dog cringes is when she is learning, not feeling bad like we think. As a matter of fact, a dog cannot feel bad for destroying property. This is only a human emotion requiring analytical thought. I did not say a dog cannot feel bad, I said a dog cannot feel bad for destroying property. If they could, they would remember what they had done in the past and know why they were being corrected or punished. A dog only lives and thinks in the present. Many, many, times an owner of a rescued dog tells me they know the dog was beat in the past because of how she cringes for whatever reason. Eighty-five percent of the time (or more) the dog was not mistreated. She just learned when she cringed she would get attention, so she does it all of the time. This is a very touchy subject, especially when it comes to rescue people and organizations. Training your dog is a process. No matter how you approach your training, it will likely take longer than you expect and will expose frustrations you’ve never even thought about. Utilize these dog training tips (I call them postulates) to get better, faster, more reliable results when training your dog. POSTULATE #1) Structure is rules. By creating and abiding by these rules you will be doing the same things and always expecting the same results. POSTULATE #2) Consistency is the key to training your dog. 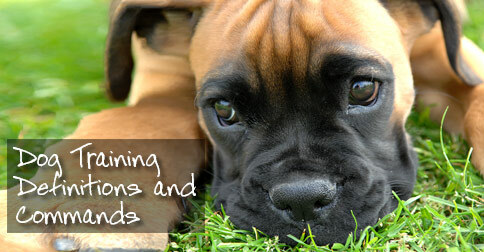 You must know how you want your dog to behave then act consistently in any given situation. POSTULATE #3) Control is about confidence. When you are confident about what you are communicating you never have to worry about being consistent. POSTULATE #4) Dominance is about trust. If your dog trusts you will be consistent in any given situation she is less likely to test the boundaries. When you create trust, you create great communication and an incredible bond between you and your dog. POSTULATE #5) Praise is the only way you are truly teaching your dog. It is the only way you are going to get her to do what you want in a way she is willing to do that thing. POSTULATE #6) Motivation is anything, positive, you use to create that your dog pays attention to you then makes a choice. Anything that is overused as a motivation creates an expectation from your dog. POSTULATE #7) Correction is anything, negative, you use to make your dog stop doing what she is doing and pay attention to you. Anything that is overused as a correction creates fear in your dog. POSTULATE #8) Understanding what you want is most important. When you put it into terms of what you don’t want then that behavior is the only thing that gets attention. Attention for a behavior reinforces that behavior whether it is good or bad attention. POSTULATE #9) Anything you do once or twice does not create a behavior or correct a behavior. The quicker you catch yourself and then correct yourself, the quicker you and your dog will learn. POSTULATE #10) It is in your dog’s nature to test the boundaries. The more structure you create and the more consistent you are the less she will test the boundaries you have established. POSTULATE #11) When you have hit the life-time ratio of praising your 10 time more than you have ever corrected, your dog will always choose to do the behavior you want, even if you are not there. POSTULATE #12) A dog truly does not know a command until she has done that command 1,000 times on her own with no prompting (motivation or correction) from the owner. POSTULATE #13) The key to understanding most commands is to have your dog hold that command for longer periods with bigger distractions. POSTULATE #14) If there is a behavior you are okay with, you just want your dog to stop doing that behavior when told, correct her with a word or phrase then immediately praise her for doing what you asked. This shows her it was okay to do that thing just stop when told. POSTULATE #15) To correct your dog well after she has done a behavior you don’t want, or away from the location of the infraction does not make sense to her. It has nothing to do with the behavior and your dog only thinks what she is doing at the time is what she is getting corrected for. You have about 5-second reaction time once you see a behavior you want to correct. Any amount of time after that is too late. POSTULATE #16) Looking your dog in her eyes is one of two things; Praise or a Challenge. As an owner you are never challenging your dog, ever. So, to look your dog in her eyes at the moment she is doing anything is praising her for that thing. POSTULATE #17) The SIT command is just getting the dog to sit. It is not about focus, nor is it about correction, though the SIT command is used more often for these two reasons than any other command. POSTULATE #18) The HEEL command is about focus for your dog. This is the command we use to warm up, to get ready, and to start the workout. Heel is rarely used in everyday situations. POSTULATE #19) The COME command is about focus for you. Teaching the COME command has nothing to do with your dog. It has to do with your understanding of what it means to be consistent. POSTULATE #20) The PLACE command is the confidence builder for your dog. For your dog to hold a command while you do other things helps her to understand that doing for you is what you want even when you are not giving her attention. POSTULATE #21) All dogs must go through resistance while learning the DOWN command. This command must be done willingly by your dog in order for her to accept her place under you in the hierarchy. The DOWN command is the most submissive command you can ask of your dog. For her to lie down for you, willingly, is the breakthrough most people need to be able to work on any behaviors they may be having an issue with. If the DOWN command is not done willingly, you will not be able to get the long lasting results you desire on many behaviors. POSTULATE #22) When leash training, leaving the leash on your dog creates a sense of control. Whether you are touching the leash or not is insignificant. POSTULATE #23) If a distraction is used that could also be a positive motivator for your dog (such as a treat or toy) you must give that item to your dog after the workout is over. This is so your dog will not fear that item. She is to learn to complete the command without the fear of some item. POSTULATE #24) Never make your dog do a command while working on a behavior. The goal is to make your dog do the correct behavior and by putting your dog into a command you are only making her work on doing that command in bigger distractions. POSTULATE #25) Body Language is the number one way a dog learns from you. Your body language can change the mood, direction, or choice from your dog without you even knowing it. It is also why we use hand signals. Dogs pick up on body language before they pick up on any other type of communication you use. It usually takes a dog about six months to really understand your body language. POSTULATE #26) Your voice tone is another way a dog learns from you. A dog can pick up on the most subtle changes in your voice that will let her know if you are serious. POSTULATE #27) Your energy is what you exert when working, playing, or just hanging out with your dog. This energy is reflected by your dog. Think of your leash as a conductor of whatever you are feeling at the time. POSTULATE #28) When you have a great attitude, no matter what the situation, you will always see better results, because you are looking for, and expecting, better results. POSTULATE #29) Dogs have personalities. Because of this fact, you will find that different dogs will react very different in many of the same situations (even if they are the same breed). POSTULATE #30) Humans have personalities. Because of this fact, you will find that different owners (such as a spouse or a child) will get a very different reaction from your dog in many of the same situations. POSTULATE #31) Dog is Dog’s best friend. Dogs understand each other much better than they understand humans.